There are many influences at work behind All the Conspirators (1928) and The Memorial (1932), Isherwood’s first two novels. They were produced in a period of intense self-questioning, rebellion against established middle-class mores, and adaptation to his homosexuality in the world outside school and Cambridge. Both are based in autobiography, making use of the Bradshaw family, the strong personality of his mother, and of the extreme dislike felt by Upward and himself for the Cambridge ‘Hearties’. However evident these aspects may be, the novels are significant achievements for a young man with an apparently narrow education. This narrowness and typicality was perhaps the secret of their artistic success. He had experienced public school and Cambridge life and regimes at a time when his generation felt the sense of having missed the chance to ‘prove’ themselves for their country. 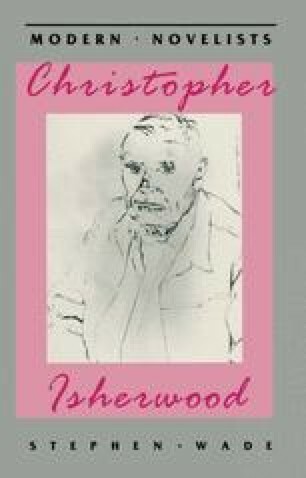 In addition, he wrote about his generation’s malaise by expressing his own with vigour, variety and the right balance of experimentation and modernity in style and language.